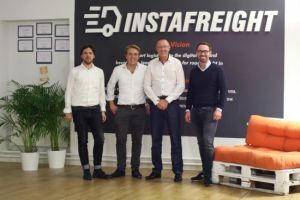 Berlin-based digital freight forwarder InstaFreight has appointed logistics specialist Dirk Reich as board chairman. With more than 35 years of experience in the industry, he was president and chief executive of Cargolux Airlines and before that spent 20 years at Kühne + Nagel. He said: “Digitizing logistics is an exciting challenge that InstaFreight is taking up. I see great potential in this business model and look forward to working with the InstaFreight team to shape the future of road logistics”. From left: Markus Doetsch (CTO, InstaFreight), Maximilian Schäfer (co-founder & managing director), Dirk Reich (chairman) and Philipp Ortwein (co-founder & managing director).